When I made Feta cheese I did not expect anyone to enjoy it. Eat it yes enjoy no. In fact, my daughters have not liked Feta Cheese but my husband has. I made toast for our dinner one night with feta cheese and he asked me if he could have more. So I am raising A Toast to Toast with Feta Cheese Potato and Onion Rings! The taste of the garlic and herbs in the olive oil not to mention salt of the feta you need not add any butter or any seasoning. The main ingredients I have used for the toast are bread, feta cheese, onion rings and mashed potatoes. I will next time use my cauliflower and potato vegetable with the feta for better flavours. I am looking for more ways finish my feta and with my discoveries, I think I will be making feta again. By the way, what is a toast? Sliced bread browned on both sides by exposure to radiant heat, such as a grill or fire. A call to a gathering of people to raise their glasses and drink together in honour of a person or thing, or an instance of drinking in this way. Let us, however, concentrate on the first toast where a bread slice is browned. The reason the bread browns is due to Maillard reaction between amino acids and reducing sugars that gives browned food its distinctive flavour. Toast a stale bread slice and it tastes better. You can toast bread in a toaster, or toaster ovens, in the past a toast was made by holding the sliced bread with a toasting fork near an open flame, such as a campfire or fireplace. I prefer the sandwich toaster or my non-stick tava/skillet. The most common toast is sliced bread but bagels and English muffins are also toasted. A toast is a common breakfast item where the bread is toasted and eaten with butter or margarine, jam, jelly, marmalade, chocolate spread, cream cheese, peanut butter or yeast extracts. But you can expect a serving of toasted and butter bread with soups or stews, or topped with heartier ingredients like eggs or baked beans as a light meal. 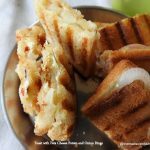 My memories of eating bread (that too was like “haw eating bread” what a sacrilege) are with homemade ghee and sugar, chatni pudi and homemade ghee and the best was with any pungent pickle that was around. 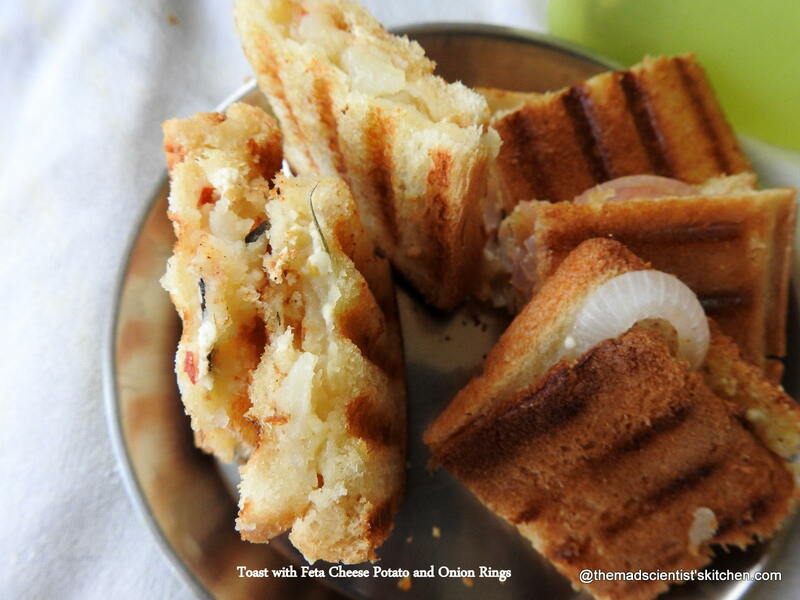 Even as I write this out my mouth is watering with the thought of toasted bread and the newly made mango pickle. The other toasts I have tried in the past are Simple Cheese Toast, Garlicky Cheese Toast, Simple Corn Toast, Delicious Grilled Sandwich. So let us get down to making Toasts with Feta Cheese under the theme Got a toast ready for dinner! A simple yet delicious Toast with homemade Feta! In a bowl add the mashed potato add the feta cheese and oil. Mix well. In another bowl mix the onion rings and the remaining feta and oil. Check the seasonings in the bowls. Apply the mashed potato to one slice. Cover with a slice of bread and grill. Meanwhile apply the onions to another slice and cover and grill. Apply the oil if remaining to the toast. You can also mix up both the potatoes and onions and make the toasts. To make Feta at home here is the link. 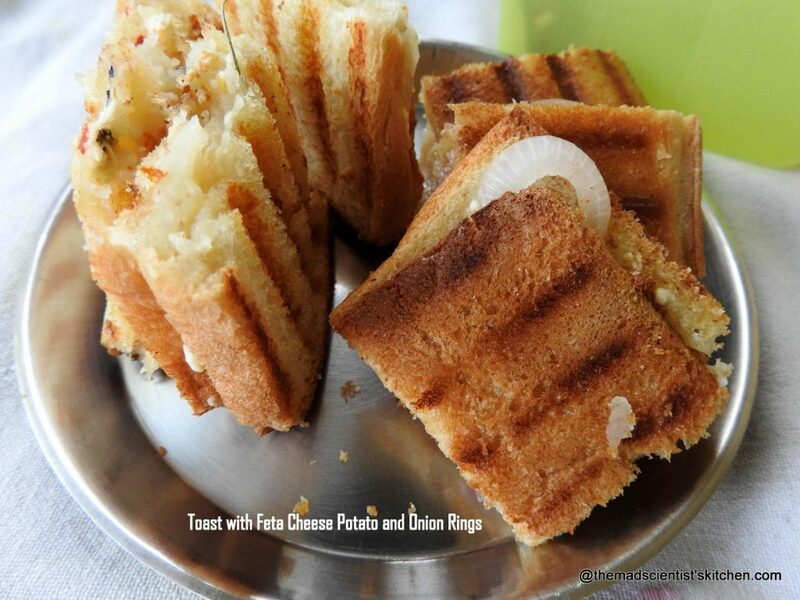 Mashed potatoes,Feta and onion ring in a toast, wow am loving it. The combination sounds fantastic Archana. I love feta.. The combo sounds great. A sprinkling of zaatar would give a flavour boost I guess!! Unique combo ! Never tried potato and feta , must try it the next time I make a toast . Such a simple and delicious looking toast. Love the addition of feta to potato filling. Sounds like a wonderful toast to enjoy..never tried feta cheese, you are making me want to do it right away!